Item is a copy of the first separate edition of Marche funèbre from Chopin's Piano Sonata No. 2 in B-flat minor. The separated third movement was played as Chopin's body was conveyed to the mausoleum on October 30, 1849, and was subsequently released as a separate publication, using the original plates (891) by Troupenas. 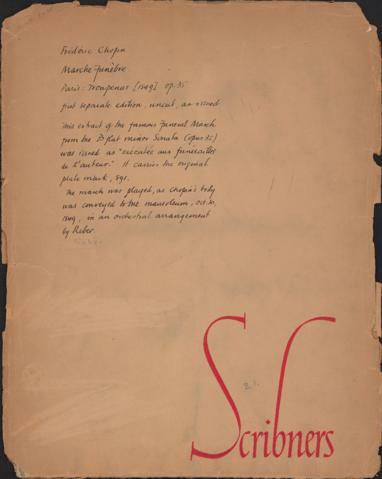 The file includes a folder and brief description of the work from Scribner.